A circular ink cake with a landscape and with animal patterns to the reverse. The reverse has a circle raised in the middle, with a three-character inscription reading Jing Shui Zhai on the top and a coiled dragon, a qilin and a phoenix among the clouds to the lower part. The other side is moulded with a landscape scene, with a pavilion amongst rugged rocks, together surrounded by wavy water. The side of the ink cake is moulded with four characters, reading Jia qing nian zhi (Made during the Jiaqing reign). This delicately made ink cake is a rare example produced during the reign of the Jiaqing Emperor (1796 – 1820), the son of the Qianlong Emperor. The three-character inscription Jing Shui Zhai, literally meaning ‘Mirror-Water Hall’, refers to one of the buildings in the Old Summer Palace, Yuanming Yuan. This piece forms part of the 64 ink sticks set known as Yu Yuan Tu (Images of the imperial buildings), each depicting different buildings in the Palace and Yuanming Yuan. The design of this ink cake imitates an archaic bronze mirror, which has a knob in the middle, after its name ‘Mirror’. The earliest examples of ink are found in traces of writing dating to the fourteenth century BC. The ink used by the calligrapher was water- based and prepared in stick or cake form. Ink was principally made from carbon obtained from burning resinous pinewood, to which lampblack made from animal, vegetable or mineral oils was added. This was mixed with glue, moulded into a cake and dried. 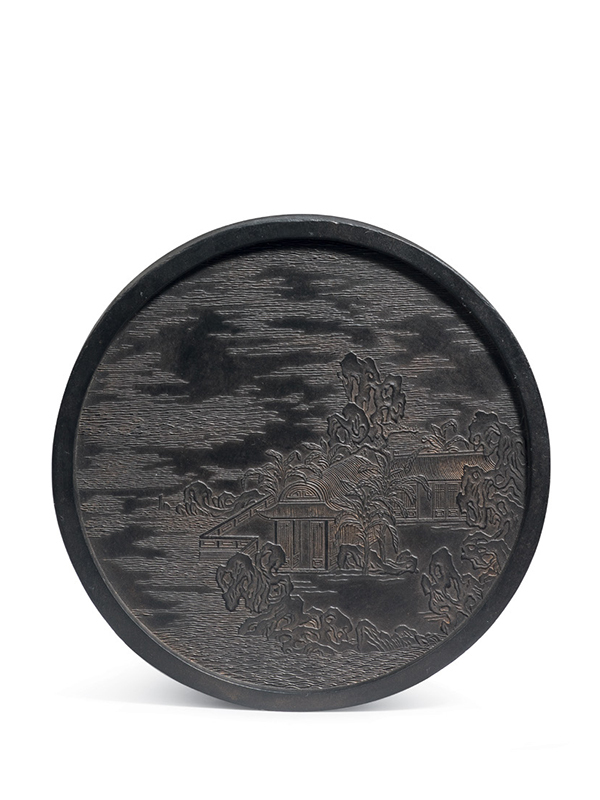 Three comparable circular ink cakes, respectively decorated with a thousand-year fungus motif, a design of two phoenixes and a design of five pines, all dated to the late Qing to the early Republic period, are in the collection of the Metropolitan Museum of Art. Two further examples, both similar with the design of the ‘One hundred sons’, are respectively in the collection of the British Museum and the Metropolitan Museum of Art. A complete set of Yu Yan Tu ink sticks is in the collection of the Palace Museum, Beijing. Rawson, J. op. cit. fig. 53, p. 87; also see the British Museum online collection archive, museum number 1909,0611.5. This piece is dated to the Ming dynasty. The Metropolitan Museum of Art online collection archive, accession number: 30.76.280. 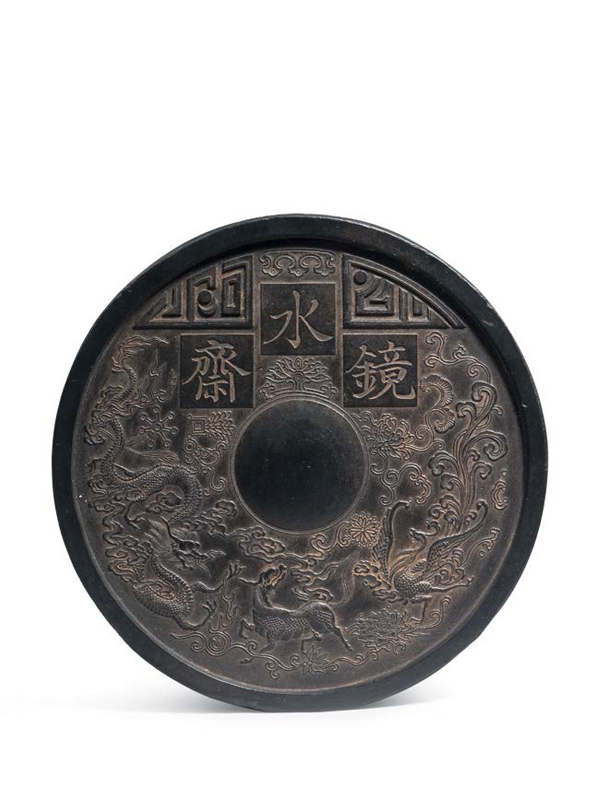 This piece is dated to the late Qing to early Republic period instead.